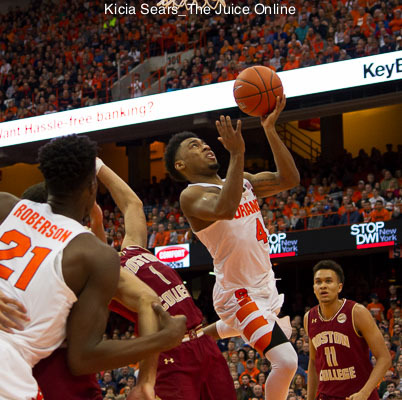 HomeBasketballOrange Watch: Could it be a winless regular season on the road for Syracuse basketball? 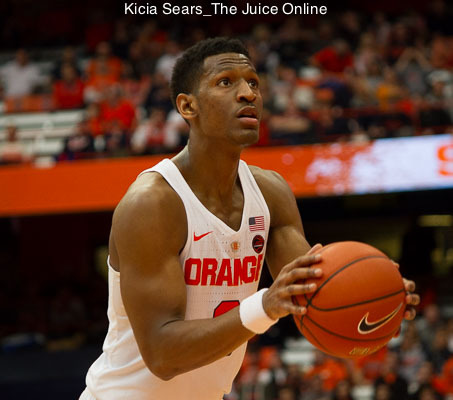 Orange Watch: Could it be a winless regular season on the road for Syracuse basketball? Could Syracuse really go winless on the road? 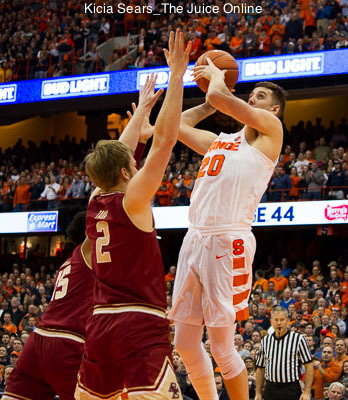 Item: Last Saturday’s 84-66 defeat at Notre Dame not only dropped the Orange to 11-9 overall the worst first 20 game mark of any season in the Jim Boeheim era, and to 3-4 in the ACC, but also an amazing 0-7 in games played away from the Carrier Dome this season. Based on the fact that the ‘Cuse has often looked dazed and confused on defense in the ACC portion of those road games falling by an average deficit of 16 points, and with the league as deep and talented as it is from top-to-bottom, unless something dramatically changes moving forward, there’s little indication that the Orange will be favored, or indeed can pull off a win at remaining road locales N.C. State, Pittsburgh, Clemson, Georgia Tech, and Louisville. You have to go all the way back 94 years to find a Syracuse basketball season in which the team did not win a road and/or neutral court game. To keep eras in perspective, the 1922-23 SU squad under head coach Edmund Dollard only played a grand total of three games outside of Syracuse the entire season, and only a total of 20 regular season games – 11 fewer than this year’s team which will play 12 games total away from the Dome. At this point of the schedule heading into tonight’s Dome game against 12-7, 3-4 Wake Forest, with the Demon Deacons coming off an impressive 93-88 win at N.C. State last Saturday – their first road ACC win in three years (8:00 p.m. ET / ACC Network), the Orange could be headed to the worst road record for any season in 54 years. In 1962-63, with freshmen Dave Bing and Jim Boeheim not yet eligible to play under NCAA rules for head coach Fred Lewis, Syracuse went 1-7 away from the brand new Manley Field House in a 21 game regular season, only winning at Colgate in the final road game of the season. » Related: Can Syracuse still make the NCAA Tournament? “Our defense is not good, it hasn’t been good on the road,” Boeheim said following the latest road loss to the Irish at South Bend, and in a rarity for the head coach at any postgame press conference in his entire 41 year career, sporting the open shirt collar-no tie visible look, as he met the media for a quick five and half minutes. 5- Clemson (0-3 at home as of Jan. 23), 4-N.C. State (2-2 at home), 3-Georgia Tech (2-2 at home), 2-Pittsburgh (1-2 at home), and 1-Louisville (3-1 at home). Why has this season been the most road challenging in Boeheim’s long tenure? “Some of its new players (as a reason for the road woes),” he’s often said this year with his usual complete candor. Even if the Orange does not end up winning a true league road game, there’s always the ACC Tournament for a shot at winning away from the Dome this season. At 0-2 all-time (SU didn’t compete in 2014) in the ACC Tourny the ‘Cuse is due for a win, and they’ll be back at the friendly New York City confines of Brooklyn’s Barclays Center to boot. For now, the schedule says home games tonight against Wake and Saturday against No. 6/8 Florida State (18-2, 6-1). Can Syracuse still make the NCAA Tournament?